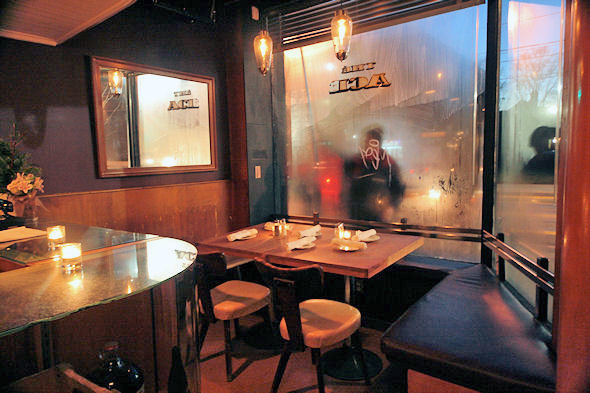 The Ace Restaurant has experienced a rebirth after almost two decades of lying dormant. 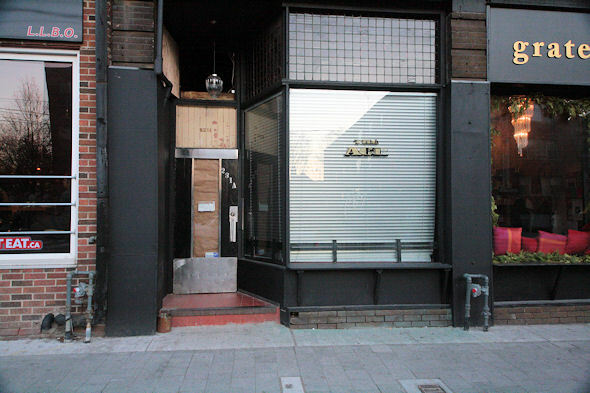 After reading about the diner back in May, I was intrigued by the history of the place, and excited when I heard it would open once again to serve hungry people on Roncesvalles. I was also curious as to what a new iteration of the space would look like. When closed, the space looks less like a restaurant and more like storage facility, but when the blinds are raised, the Ace exudes warmth. On my visit, the front window was beaded with condensation and soft candlelight cast shadows on the walls. We walked through the door and took a step back in time. The new owners have kept all of the original fixtures and even the pagoda adorned wallpaper from its previous life. 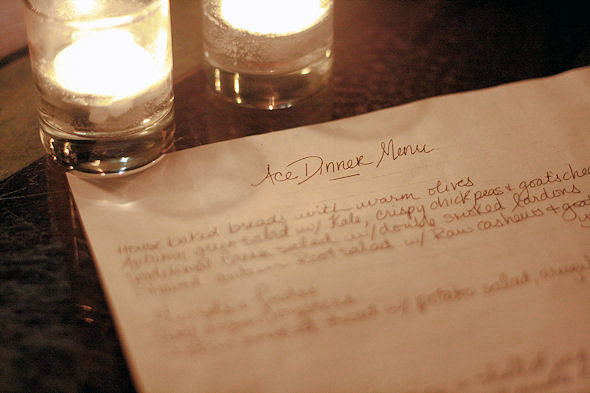 Diners can choose a booth or pull up a stool at the low counter/bar before making a choice from the simple hand-written and photocopied menu. Tables are set with mismatched plates and cups with patterns customers might recognize from their grandmothers cupboards (because we did). Its 1950's diner meets Chinese restaurant, and it works. We chose a booth at the back by the open kitchen and ordered some drinks to start. They have three beers on tap, from which I chose a Wellington County dark, given the chill in the air outside. Kathleen, my dining companion, went with the omnipresent Mill Street Organic (Cameron's Cream Ale is the third option). After being served our pints, I realized that I didn't see any taps. Where did this beer come from? 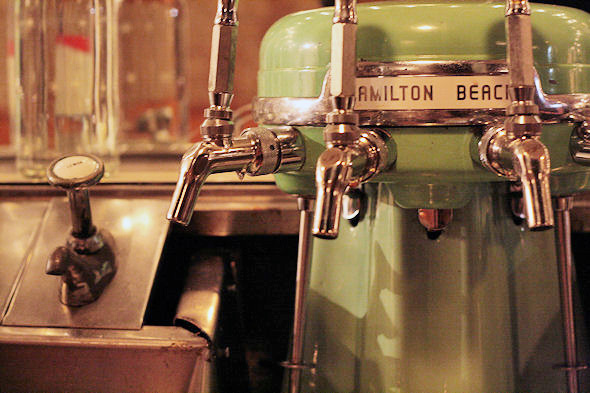 The answer â from the vintage Hamilton Beach milkshake maker, that's where. Now, I love a good milkshake, but I love beer more, and I was very impressed with this concept. Bonus points to whoever came up with that idea. I had heard about their fried chicken ($17) but I wasn't in the mood for it. Luckily, Kathleen was. 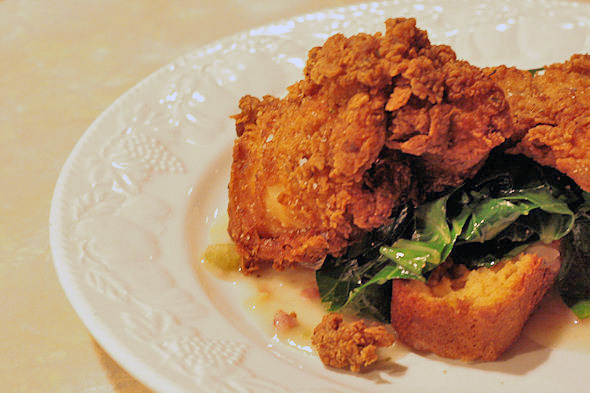 Three portions of chicken came served with collard greens, atop a piece of cornbread, and ham gravy. The chicken breast was very juicy and although fried, it wasn't overly greasy. Kathleen enjoyed her meal, but the price didn't exactly reflect the dish. She also wished that the corn bread came on the side instead of smothered in gravy, so the choice to dip or not to dip would be hers. 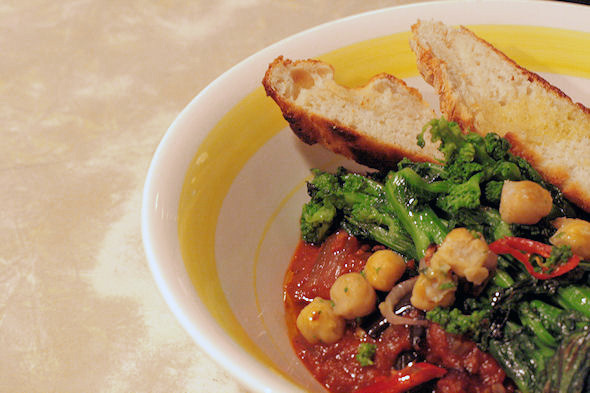 I ordered the Eggplant Ragout with rapini and chick peas ($15). It was filling, and it was nice to have rapini because it doesn't seem to get a lot of play these days, and I'm a bit spinach-ed out. Although not offensive by any means, I wouldn't order the dish again. There was a hint of a spicy kick to it, but not much else. I think I might have liked the bread it came with more. Biscotti shaped, it was like a cross between corn and Irish soda breads. Full of bread and beer and with a little one in tow that was getting a bit hot under the collar (that window wasn't steamed up for nothing!) we passed on dessert that included homemade zucchini bread with oatmeal ice cream. Dang. The Ace won me over with friendly staff, aesthetics and ambience, and this is what I will return for. Next time I'll probably pass on dinner and skip right to dessert, or maybe try out their weekend brunch. I do, however, anticipate drinking my fair share of pints perched on one of their bar stools, with a side order of nostalgia.